I had heard so many great things about this book and saw the cover floating around on social media. A few weeks back I was in Waterstones, planning my launch party and I saw it on the shelf. I was thinking I'm sure The Hate U Give is from a Tupac song. Then I looked on the spine and it said THUG. I definitely knew it was! So I started to read it. Blurb: Sixteen year old Starr lives in two worlds: the poor neighbourhood where she was born and raised and her posh high school in the suburbs. The uneasy balance between them is shattered when Starr is the only witness to the fatal shooting of her unarmed best friend, Khalil, by a police officer. Now what Starr says could destroy her community. It could also get her killed. Starr leaves a party with Khalil and they get pulled over by the police. The police man shoots Khalil 'thinking' he was reaching for a gun but he wasn't. There is an uproar in her community because everyone knew Khalil and his struggles and he didn't deserve to die. On the other hand, the kids at Starr's school just think it's another 'black issue' and really don't understand why anyone would be backing Khalil. Starr is scared to speak her truth because of the repercussions from the community and her peers. This is one of the realest books out there today. 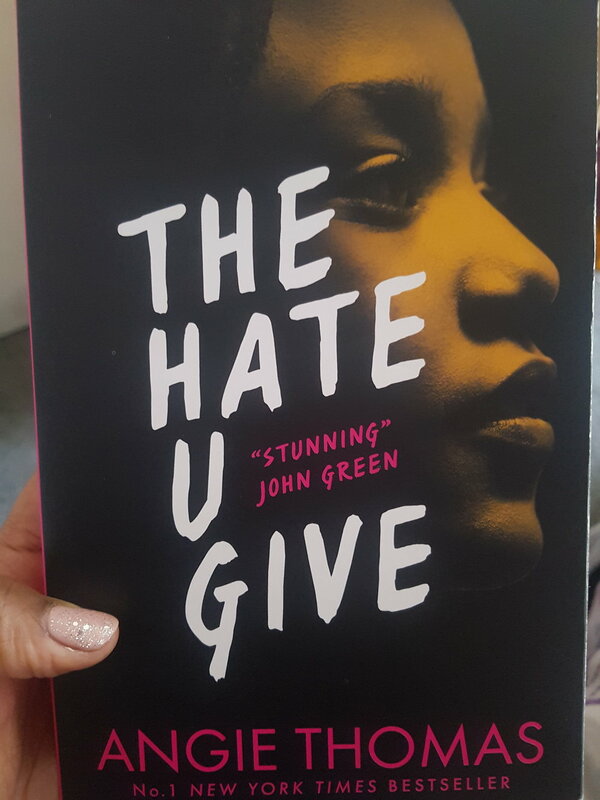 The Hate U Give covers racism, diversity, interracial relationships, gang crime, poverty and that's just to name a few. I loved how Angie Thomas showed the stereotypes but interlinked them in such a great way. Starr's got a white boyfriend, she deals with not tying to be known as a 'hood girl' or 'the angry black girl.' I liked how she used the characters to explore racism and there's one character in particular who says the most racist things and yet is offended when called out for being racist! Starr's family are from the hood but the kids aren't hood at all, infact they are destined for greatness. I love that they are an up and coming family who want and have the best for their kids, even though they live in a gang controlled community. The highlight of the book for me was acknowledging those that have been unintentionally killed by the police - Alton, Trayvon, Saundra to name a few. I thought that was beautiful. The dialogue in this book is so raw and honest and it's a story that needed to be told and I applaud Angie for doing so. Anyone that doesn't understand what the Black Lives Matter movement is - you need to read this book. I'm so happy this is being turned into a movie. The education in this book is real.